Ideas, actions, and words. This is how we change our world. Every day, individuals manifest thoughts and endeavors that cross their personal lives and into larger communities; sometimes intentional, sometimes not. Like ripples radiating across the surface of a pond, small disturbances can lead to propagating effects, whose radius may reach even the most static waters. For 2019, TEDxCMU invites our audience to contemplate the minute movements that cause marvels all around us. We will explore inspirations as well as consequences, ultimately asking ourselves, not if there will be an impact, but how far will it go? TEDxCMU is proud to introduce the official TEDxCMU Web Application, available here! 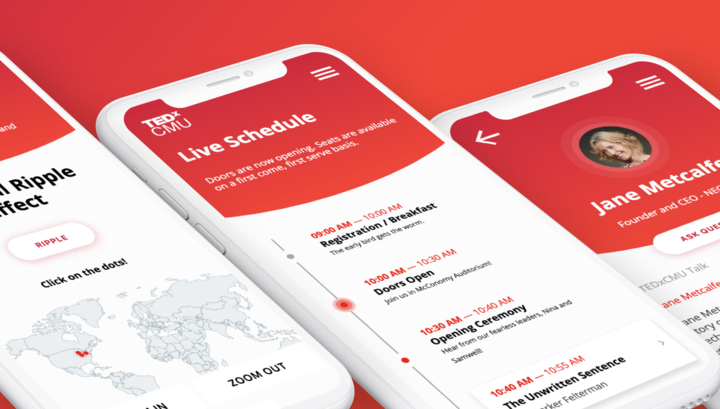 The application is meant to expand the "Ripple Effect" of this year's event, letting audience members engage with speakers in more direct, meaningful ways. Have a question? Send it straight to the speaker, and check the Q&A section later to see what they say! This application doubles as a real-time schedule, which we can update at a moment's notice to keep the entire audience in the loop. Get up to date information in just a click, and interact with other event attendees on the Brain Food page. We're excited for everyone to check it out! TEDxCMU brings together some of the world’s most bold and innovative thinkers to give the talk of their lives. This immersive, daylong conference shares the talents of Carnegie Mellon University's speakers and performers with the Pittsburgh community to create the magic that is TEDxCMU.